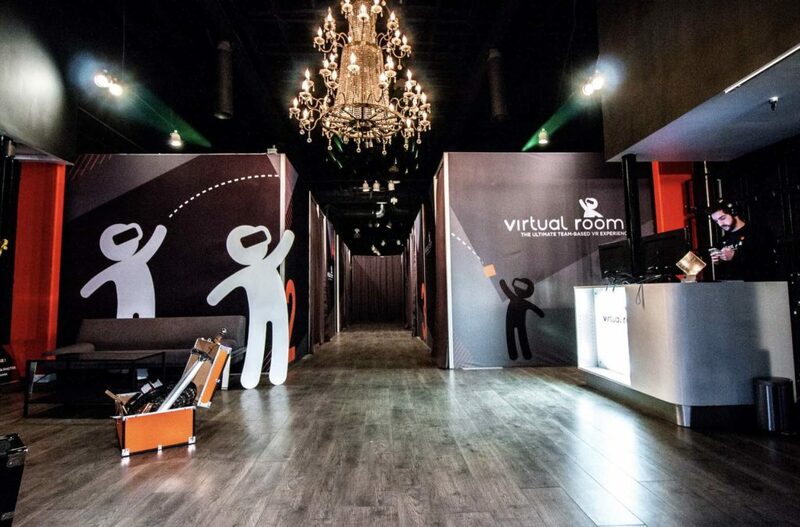 The reception area of Virtual Room in Hollywood. Photo by Christina Champlin / We Like L.A. The year is 2217. You and your friends stand in a command center while a world on fire rages outside the viewscreens. You’re Team Omega, an elite group of operatives tasked with going back in time to collect data needed to secure a better future for you and future generations. You must also destroy artifacts left behind by Team Alpha, who were unsuccessful in this perilous quest. This is the premise of Virtual Room, a new virtual reality game space located right on Hollywood Blvd. at Wilcox, in a storefront formerly occupied by one of the boulevard’s superfluous lingerie shops. 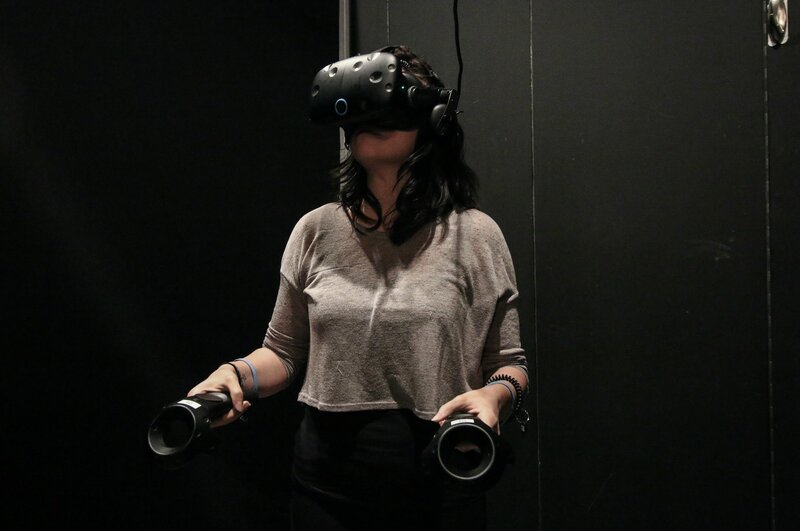 While many VR experiences are meant for just one person at a time, Virtual Room’s games are all team-based. Groups of two to four will each be outfitted with an HTC Vive VR headset and controllers, with each player in their own booth, separated from the hallway with a thick curtain. The booths (about 10-by-10-feet) aren’t particularly large, but there’s enough space for you to stretch your arms out and take a few steps in any direction. Should you stumble too close to a real-life wall, the game will let you know. The headsets are connected overhead, giving the player a fair amount of mobility without having to worry about tripping over a cord. About to enter virtual reality. Photo by Christina Champlin / We Like L.A. Inside the game, you can see your other teammates’ torsos and hands. You all sort of look like colorful Storm Trooper/Power Rangers hybrids, but the tracking is precise enough that if your friend decides to dance or gesture like an air traffic controller, you’ll see that in real time. You’ll also be able to talk to each other, thanks to headphones and a mic attached to your headset. The game itself runs about 45 minutes, and involves traveling to a handful of different time periods, ranging from prehistoric times to the Lunar landing. Each scene offers a different puzzle, which your entire team must complete before moving to the next era. You can expect to push and throw objects, shoot a bow and arrow, and assemble and use tools. The puzzles are fairly simple, making the game accessible for VR virtuosos or neophytes. 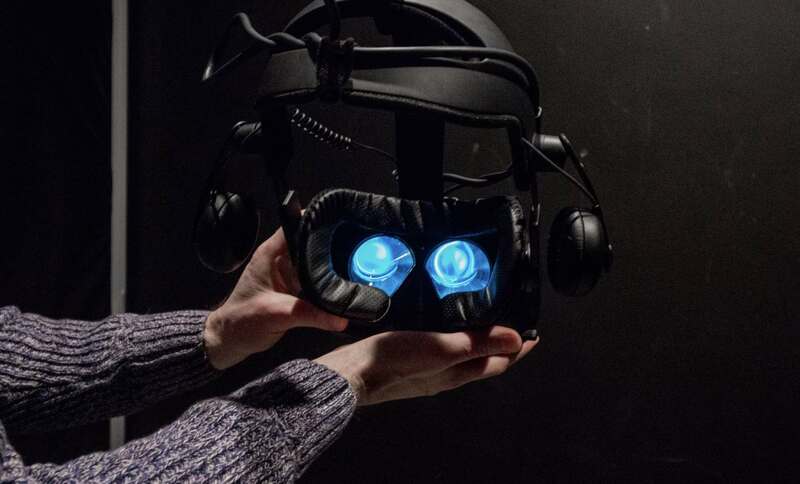 The author of this article in the midst of a VR experience. Photo by Christina Champlin / We Like L.A. Escape room enthusiasts will find it a walk in the park, but that isn’t to say it’s not fun or that there aren’t hidden challenges. Our team of four found we were able to complete most of the puzzles well within the 10 minutes or so we were allotted in each scene, but not without a lot of bumbling around and laughing at one another. As it turns out, tossing objects on the moon is hard. Gravity just doesn’t work the same way as it does on Earth. When the game’s complete, you’re free to take selfies in VR, as well as team photos with props in the front room. We took a selfie of our team in VR after the mission was completed. 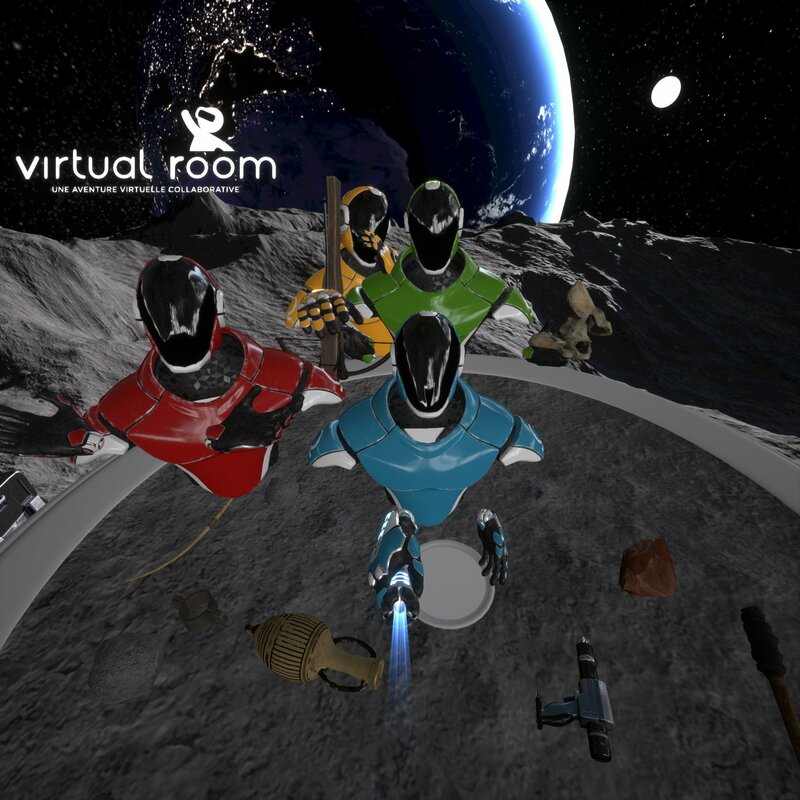 Virtual Room plans to launch additional missions within the same narrative in the future, complete with harder, more complex puzzles and new eras to explore. Virtual Room is open Monday through Sunday from noon to midnight. The game is suitable for ages 12 and up. Tickets are $28 to $35/person, depending on day of the week and time, and can be purchased online. There are eight total game rooms, plus event space in the back should someone want to book it out for a private party or a futuristic team-building exercise.